Earlier this year Roslin Cells and Lonza signed a stem cell media development deal the firms hope will play a key role in the drive to translate scientific innovation in the stem cells field into clinically applied regenerative therapies. The agreement is centered on the development of clinical-grade media for applications including the maintenance and expansion of pluripotent stem cells and their differentiation into predefined cell and tissue types. The Lonza and Roslin Cells team will be perfectly placed to tackle the scientific, technical, and regulatory aspects of developing GMP-grade media suitable for the large-scale manufacture of stem cell-based products, according to Aidan Courtney, CEO of Roslin Cells. The fact that pluripotent stem cells are, by their very nature, capable of differentiating into completely different types of cells will require a new mind-set in terms of developing culture media. Maintaining stem cell lines used for therapeutics will require media and growth factors capable of keeping them undifferentiated while maintaining pluripotency. A whole range of media will then be needed to effect their expansion and reproducible differentiation into predefined cell types. “At the research or even early clinical phases of development, cell production is often carried out at the laboratory scale,” continues Phil Vanek, Ph.D., head of innovation and business development at Lonza. 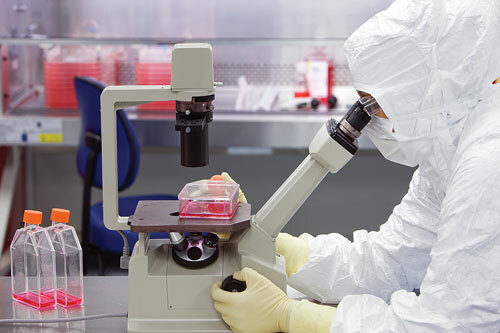 “However, the biggest challenge facing the industry relates to later-stage clinical development and commercial production of stem cell therapeutics. The collaboration by Roslin and Lonza will, thus, be multifaceted. “We are interested in all types of pluripotent stem cells, which in itself throws up many challenges,” Courtney adds. cGMP manufacturing of cellular therapies requires careful consideration of cell type, media quality, culture platforms, and quality systems.